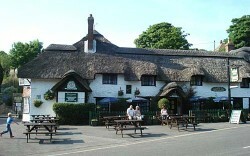 Large friendly pub/hotel in the small village of West Lulworth. Excellent and reasonably priced food is available at lunch times and in the evenings. 2 or 3 well kept real ales are available when I last visited but believe the selection has increased dramatically. They also carry up to 12 draught traditional ciders. There is a large terraced garden with tables behind the pub for those warm days. The car park is across the road just off School Lane. Accommodation is available.